Professional golfers hone their swings during practice. A professional golf tournament on the PGA Tour takes place over four consecutive days. Tournaments start on Thursday and conclude on Sunday. From start to finish, there is no time between days of the tournament. Most PGA Tour events cut half of the field after two days of tournament play. This leaves only half the field to play the final two days and receive prize money. Professional golfers, then, have three to five days in between the start of one tournament and another to travel, play practice rounds, work with their swing coach and stay conditioned. Professional golfers on the PGA Tour compete all over the United States. They are required to travel to different cities every week for the next tournament. In between tournaments, the first thing a professional golfer has to do is get to the next tournament. Most professional golfers travel by air, but some prefer driving to tournaments. For many, a full day of travel is required to get to the next tournament. 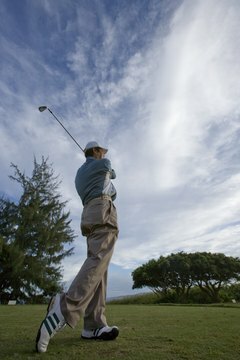 Professional golfers may play multiple practice rounds at the tournament site to prepare for the tournament. Practice rounds are typically played on Monday and Tuesday, with Wednesday being reserved for a pro-am tournament. Select professionals will be asked to play in the pro-am with amateur partners. Some professionals may travel to the next tournament early if they missed the cut in the previous tournament. In that case, they may play practice rounds on Saturday and Sunday as well. Some professional golfers ask their swing coach to travel to certain tournaments with them. Professional swing coaches follow their golfers around the course during practice rounds and help with golf course strategy. They also spend hours on the driving range and putting green as their clients hone their swings and putting strokes. Because the PGA Tour is so competitive and the season is so long, many of the professionals have a regular workout regimen when they travel. Most will focus on building stamina, flexibility and light weight training.